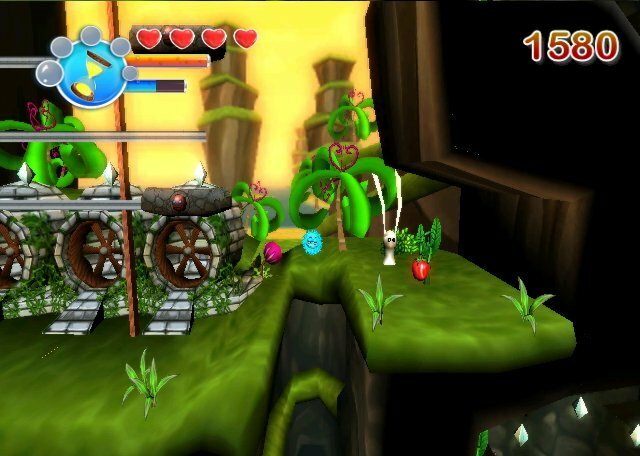 We've seen the rolling platformer idea explored several times over the years to varying degrees of success, but with the release of Furry Legends, Gamelion is attempting to inject a whole new level of playability into the standard formula and make things more interesting through the use of creatively-designed levels and a host of puzzle-solving elements. 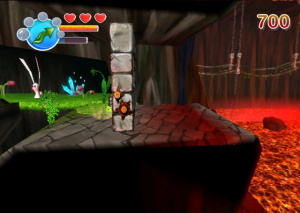 Episode One marks the first release and what basically amounts to the overall game's first five levels for players to tackle. In Furry Legends, you take on the role of a Furball whose ultimate goal is to reach the end of each level safely. While this will generally feature a lot of rolling around and jumping to and from various platforms, it also features a wealth of other gameplay mechanics to make things more interesting. You'll see everything from bashing through wooden barricades and walls to using one of your three available Furball's various FurPowers to navigate many of the dangers you'll be faced with in each level. 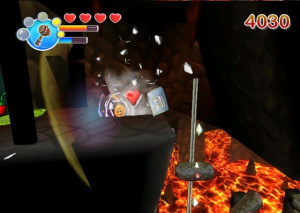 Rolling around and jumping play the biggest role in navigating the game's levels, but puzzle-solving and doing battle with enemies also comes into play from time to time. There will be many times when you'll be forced to move boulders around, activate switches and even rescue other Furballs who've become trapped throughout the game. You'll also have to deal with a steady flow of enemies that can make things difficult for you. You can target these enemies using the "Z" button and then quickly flick your Wii Remote to make your Furball attack. While this works fairly well most times, it can be a bit erratic when you're faced with a large number of enemies or at the very least one that's overly aggressive. There are also three different Furballs to take control of once you've rescued them, each featuring their own unique FurPower. These special powers range from super speed to the ability to slow down time in a Matrix-style fashion that will allow you to manoeuvre through some of the more menacing and fast-moving dangers. The catch is that you only have a limited amount of reserve FurPower and you'll have to use it wisely. Of course you can always guide your Furball back to a Red Berry bush to eat more of the berries in order to restore some of this FurPower if needed. 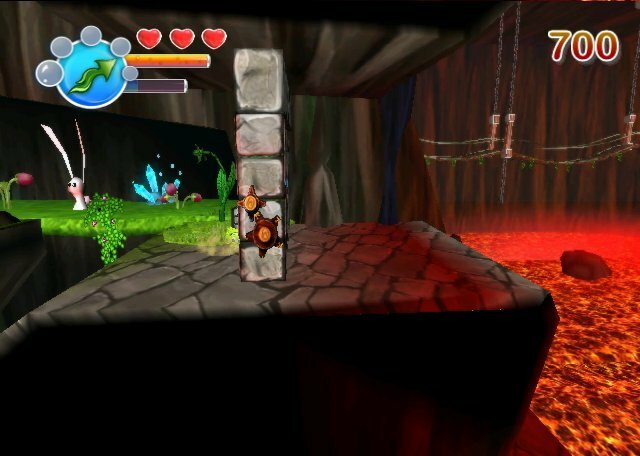 The level designs in the game are extremely well constructed and offer up a very solid level of platforming and problem-solving challenge. The downside to this is that the game uses a very loose and floaty control system that can make navigating these clever challenges a bit more tricky than it would normally be. It's understandable why the developers chose to give the game this type of feel given how challenging it makes the game, but it can lead to some very frustrating moments, especially when you've put in a good 20 minutes on one level only to run out of lives and have to start all over again at the beginning. It's something to at least keep in mind if you're not very tolerant of a looser style of control. The world of Furry Legends is filled with very lush backdrops and some extremely vibrant color schemes to make the game's unique world come alive. There's a nice level of detail found throughout the game's different areas and even the enemies and Furballs themselves show are all very well-drawn and animated. Given that this is only basically one world of a much larger gaming package, there's not a lot of variety in the various scenery, but considering the attention to detail of what's there, it's difficult to complain too much. The musical score of the game is a lot like the visual presentation in the fact that it's very well done, it just doesn't vary a whole lot throughout the game. There are some very catchy musical tracks that do a marvelous job of conveying the light-hearted theme of the game, but after a while they all tend to sound alike. They certainly don't get to the point of becoming annoying, but a little more diversity might have been a nice touch. How much fun you get out of Furry Legends is going to mainly depend on what type of gamer you are: it can be a rewarding experience, but that's of course for players who can overlook its overly floaty physics and somewhat erratic attack controls and just enjoy it for the light-hearted platforming romp it offers. That being said, those who demand a certain level of precision in their controls might end up finding it more frustrating than fun. There's plenty of fun and quirky humor to be had, but given the clever level designs and gameplay ideas, you can't help but be left wondering how much better it would have been with a little tightening up in the control department. Only 5 levels? 1000 Points seems a bit too much for such a tiny game. And Episode One? This means the whole game costs $50 and has 25 levels? Hmm, I don't know if I like that. Judging from videos it looks wonderful, though. But I wish that developers would actually make complete games instead of taking the epsiodic (and overpriced) approach. I tend to agree with Omega. I haven't downloaded the game yet (since I keep getting an error code) but I'm hesitant to keep shelling out money for a game that can't deliver everything it should the first time. @grenworthshero if you were one of the contest winners and are getting an error while trying to redeem the code, its probably because you're trying to redeem it as a download ticket when you need to redeem it as a Wii Points Card. If you weren't a contest winner then disregard this, but I'm throwing the heads-up out there because that was the problem I had. @Omega How do you know it's 5 episodes? But I do agree, 5 levels per episode is too short. Looks good, but the price seems a bit too big. Making it 800 Wii Points would have been a better decision. Still, this is one of the better WiiWare games. When people who play and review games for a living are frustrated, what chance do the rest of us have? I don't enjoy the floaty controls in LBP - though I still play it daily, but I've given up on the main game and only play levels with infinity lives. Well, back to Jett Rockett. Thanks for the review. Will prolly go with Jett Rocket instead. How can you not mention that this game is hilarious? Did you read all the signs posted throught the game? Or read the dialouge? Or see what happened at the end of level 2 (I won't spoil it of course)? Seriously, I thought it was worth mentioning. "Now it's time to play with your b- boulders!" Aside from that, great review Corbie. I personally think the score should be higher, but I won't go on all day complaining about it. I definetely agree about the controls and frustrations, but I guess they just didn't bother me as much. @mariofanatic128: I don't know, I only guess. Maybe the complete game consists of 2 episodes with 10 levels and costs 2000 Points? Still way too expensive, if you ask me. Thanks for the great review, Corbie. Now I'm definitely not buying it. A pet peeve of mine with wiiware is that developers seem to think that the best way of making games is to go with episodes, it's really more of an excuse to be lazy with the game and to get more money for it. Honestly developers should try their hardest to make a really good game so that it gets out there and heard, then make a sequel. Instead they split up their games into pieces that can't even be called full games themselves, it's really nothing short of a pathetic scam. Thanks for the review though, it's nice to know the details of something when you think about buying it. @Omega I agree, that would still be too expensive. Looks pretty good, but it seems short, and for 1000 Points, that's pretty expensive. And that stone cube thing looks like a Thwomp. ""Honestly developers should try their hardest to make a really good game so that it gets out there and heard, then make a sequel. Instead they split up their games into pieces that can't even be called full games themselves, it's really nothing short of a pathetic scam."" So you're saying the Tales of Monkey Island games should have been one 5000 point download instead of five 1000 point download? Because thats what would happen. And who would pay 5000 points in one go? @moosa Thanks, that's what I've been doing wrong. I'll have to try it again. I'm not saying that this whole episode-based gameplay doesn't have it's place, TellTale games has a tendency to release them rather well being as they're presented in a storybook like fashion, it fits. While I myself haven't played these games I've heard that they're fairly good. What I'm saying is that games such as this and other platformers shouldn't be split up because they can. Take sonic 4 for example, it's been confirmed to be split into episodes when it's main focus is to mimic gameplay and most likely length of the other Sonic the Hedgehog games available for almost half the price of ONE episode. That's when I stopped caring about the game. As for price, yeah it'd be a bit more expensive, I'm not saying that it would be all their prices added up though. I think that if developers added up these 5 episodes and put them all in one they'd figure out for themselves that these games are in fact not worth $50. Take Lostwinds for example, I loved the games and my only complaint was that they were way too short, both episodes together (in my mind anyway) should only cost $12. But I'm done ranting in this post, you seem to have gotten me on this whole price shenanigan here. Seeing how long it took them to complete the 1st part, I doubt they wanted to just get it out quickly and grab the money. Maybe you should not treat each chapter as a part of a bigger game, maybe it's a self contained product, and chapter 2 is just a sequel they have planned anyway (like, say... Lord of the Rings books and movies)? I think that still, this game deserves some more love for things that have been not pointed out by the reviewer - its humour and cool bizzarity. Btw. I think I read on their blog or in some interview, that its not developer who names the price, but Big N.
Maybe they would be fine with 500 or 800 price point? So you're saying the Tales of Monkey Island games should have been one 5000 point download instead of five 1000 point download? They should have been 5 downloads for 500 points each. The same goes for Strong Bad. I think that is a way more reasonable price for a downloadable point & click adventure. Im my opinion downloadable games should not cost as much as retail games. @thaantman - By email I think it was the day the game was released? "....its humor and cool bizzarity." Finally somone else mentions it! It was funny, but I wasn't rolling in the floor while playing it. Perhaps this quirky humor strikes a chord more with some than others. As far as I know, getting humour right is one of the biggest challanges. Everyone has a different taste, and to entertain one, can be to annoy the other. If you didnt get annoyed and you liked it, its already a success. Well, I wouldn't say I was "rolling (did you do that on purpose?) on the floor" playing it, but no game has come close to doing that for me ever, so I wasn't exactly looking for that. I just found it to be very funny and thought it might've been worthy of inclusion in the review, but I guess everyone has different opinions on humor. Well I did actually go back and put a mention in the review, and yeah, the "rolling" thing was on purpose. I also think this game would work better on the DSi system, so I'm quite curious now about the DSiWare prequel. Can't wait to try it out. Yup, still disappointed. Was hoping for an adventure starring furries, instead its yet another rolling physics-based platformer. Yuck. Won the game, so I'll get it. Sounds fun yet frustrating. This is not a game you can just rush threw, you need to take your time or you are going to end up dieing alot. I will pass on this, This isn't my type of platformer. I finally ended up getting this game after I put the code in the right place. Great review, Corbie (egads, another infamous 7!) I think you perfectly addressed the frustration to be had. Nice review Corbie. I totally agree that the issues with the controls make this game more frustrating than fun. Too bad because I think that this game had a lot of potential but unfortunately it just couldn't deliver. Hopefully the problems will be corrected in the next chapter but I'm not sure how many people will actually be willing to give the next game a chance. I'm really glad that I got this game for free but I'm finding it kind of hard to recommend to anyone. I think that I am just going to wait for the review before downloading the next chapter. The video looked nice and the visuals are pretty, but I really don't consider a game a platformer when you are just a ball rolling around. I don't know what i hate most in this game: the repetitive music, the clumsy controls or the inconsistent frame rate. 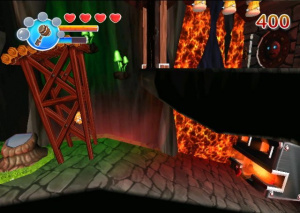 After playing the demo (and every other WiiWare demo so far), I don't understand how it can possibly be so difficult to just cut unnecessary onscreen details and make a game with a decent framerate so that everything doesn't wind up feeling so laggy. Is there some sort of limitation on processing power or something that WiiWare games have that retail ones don't? Is the SDK really bad or something? Is it just programming laziness? Seriously Frobot, I want to know!